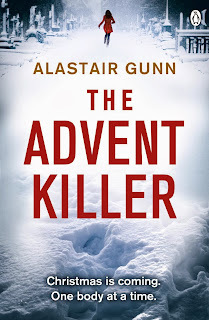 Alastair Gunn, author of The Advent Killer, was in my class at primary school, and is currently engaged to former secondary school classmate of mine. I should, however, point out that I haven’t seen Alastair since 1987 or his lovely fiancée Anna since the mid-1990s, so these tenuous connections haven’t coloured my judgement of his debut novel either way ... although I am of course furiously jealous that Alastair is a published author and I’m not. The Advent Killer is a dark crime thriller in which DCI Antonia Hawkins of the Metropolitan Police is faced with catching a serial murderer intent on dispatching his victims in ever more grisly ways. While it’s very much a British book with a solidly realised British setting, it's in many ways more akin to the work of American thriller writers like James Patterson (when he still wrote his own books) or Thomas Harris (when he still wrote books that weren’t completely barking) than a lot of British detective fiction. It’s strong on action rather than the cerebral minutiae of detective work and the killer himself is creatively deranged in a way that reminded me a little of the murderer in Se7en (which is of course an entirely good thing). I can also imagine that The Advent Killer would adapt brilliantly for TV; producers of crime dramas would do well to pick up a copy. Antonia Hawkins is a convincing protagonist, flawed enough to be believable, fallible enough to be interesting, career-driven without being cold and vulnerable without needing to be rescued; she’s also a great example of a female lead who is written very credibly by a male author. There are the usual conflicts with superiors, maverick hunches and relationship disasters we can generally expect from a detective in this genre, and perhaps I’d like to see a little less reliance on that formula when Hawkins returns, but overall the character is very much up to the task of carrying the novel and is a heroine you’d find it hard not to root for. 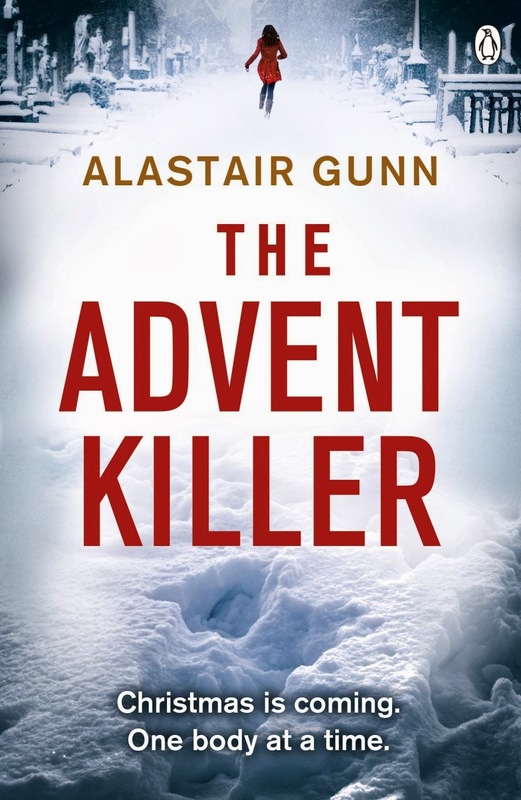 Gunn has also taken the interesting decision of stepping into the mind of the killer, with sections of the novel written from his perspective. These sections work very well indeed: they’re insightful as well as chilling and do a fine job of building tension, neatly punctuating the book with changes of pace and atmosphere. One of my biggest gripes with far too many crime novels is the general standard of prose, which often seems to be neglected in favour of plot. No such worries here, though. The Advent Killer is well-written throughout in a tight, economical style that makes for an effortlessly enjoyable read – something far harder to achieve than most people imagine. There is just enough detail and enough well-chosen description to give us the essentials we need to have a sense of the characters and settings. I might have liked a little more expansion on the killer’s specific choices of victims towards the end, but this is a very minor quibble indeed. Nothing about Alastair Gunn's writing is superfluous or clumsy and not a single sentence jars. If you’re looking for a gripping, gruesome, fast-paced page-turner that will keep you guessing right up until the killer’s identity is revealed, and you’re not too hung up on mundane realism – we’re not dealing with any old common-or-garden murderer here – then The Advent Killer is for you. I found myself happily racing through it in a couple of sittings, and I’d defy anyone who picked it up not to want to do the same: it would be a great choice for a long journey or a day on the beach. It seems that Alastair Gunn has a second Antonia Hawkins book planned. I'm looking forward to it already.